- strategy models and actual practice, based on interviews with prominent, world- wide B2B practitioners.The book contains 9 'maxi-cases', specifically written for the book, about how some B2B companies have actually been practising Case-Based marketing, in areas such as strategy, branding and e-Business. These cases described the practise of major global companies, including ITT Industries, Ericsson, Sandvik Steel and Alfa Laval, but also smaller companies in Sweden, America and the UK. "There are few good books for B2B marketers, despite the fact that they form the majority of the profession. Steve Minett's excellent and highly originally book is a welcome exception: every B2B marketer should read this book," Charles Nixon, Chairman of Cambridge Marketing College. Steve Minett PhD has spent most of his working life in B2B marketing for large European & North American multi-national companies. He has a BA from the University of Sussex, and an MA and PhD from Stockholm University. He is also a Chartered Marketeer who undertook postgraduate work at Oxford and Minnesota Universities, and lectured at Stockholm University. In 1991, Steve established his own agency, Minett Media, which works with a wide range of clients from multi-nationals to companies with less than 10 employees. He has written over 200 articles in more than 60 different international journals. "I picked up your B2B Marketing book over the weekend and couldn't put it down. As a B2B specialist for our agency, I found it to be very enlightening and dead on. Your ability to demonstrate the philosophical differences in B2C and B2B marketing should serve as the foundation for all marketers in their efforts to provide value to their clients, organizations and companies. Thanks again for bringing this book into my life. God Speed." 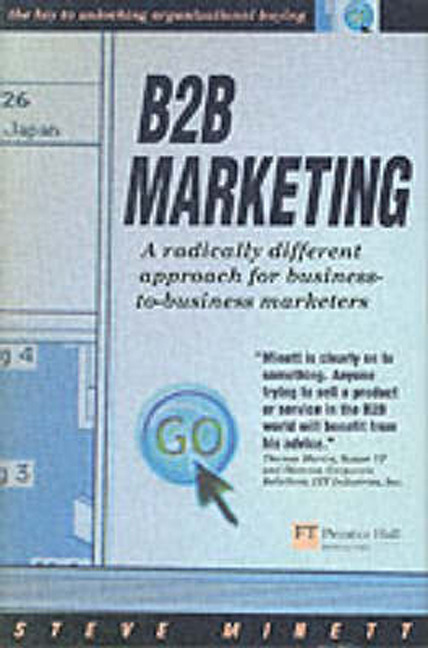 "The quote on the jacket of this book claims that Minett’s B2B Marketing is ‘a radically different approach for business-to-business marketers’, and to be honest that is exactly what this book offers."